Allegro Medical presents the Universal Beverage Holder . Now you can have your coffee, water or soda right at your fingertips. This handy universal cup holder attaches to most walkers, wheelchairs and bed rails, allowing you easy access to your drink. It can hold containers anywhere from 10 to 32 ounces, including standard and travel mugs. The removable styrene insert helps accommodate different cup sizes and keeps drinks cooler. The beverage holder is customizable for different situations. Choose the most comfortable position and attach it vertically, horizontally or even as a swing mount. 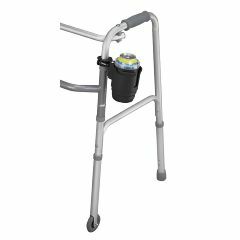 This convenient cup holder attaches easily to most walkers, wheelchairs and bed rails. You can mount it horizontally, vertically or even as a swing mount. Removable styrene insert helps accommodate different cup sizes and keeps drinks cooler. I plan to buy another one. Convenient. Easy to Use. Stays in Place. Can Withstand Use. Daily Use. Travel. Home. Long Trips. Short Trips. We put it on the wheelchair frame and we don't have to keep picking up water bottles off the floor anymore! Can Withstand Use. Stays in Place. Easy to Use. Convenient. Works w/ ALL Cup Sizes!. I have used this for a couple of years attached to my wheelchair. I love it so much that when I got my electric tricycle, I had to quickly order another one! As a one-handed wheelchair user this item has been a lifesaver. Now I can navigate my chair while carrying a drink. - Intended it for daily use at home, attached to walker. - Difficult to install, to begin with. Also, hardware inferior; stripped bolt trying to tighten it enough so that the holder would stay put, but to no avail. - Won't stay up, even with no beverage in it; as a result, of no use to us whatsoever. Waste of good money. Will it securely hold bottles? Such as a 16 ounce coke bottle or a beer bottle? What dimension tube does it fit. What dimension cup will it take -- largest size? it was attached to a standard wheelchair footrest tube. However, it comes with a front and back piece held together with nut/bolt. The screw was longer than needed for the standard tubing of a wheelchair. You could use as long a screw as you needed that can get through the holes of the front and back piece. The cup holder couldn't hold a large water bottle with about a 3" circumference but did hold a bottle that tapered at the bottom. It comes with a cup to insert in the holder. Can this product be used with forearm crutches? I think so. It was attached to the vertical tube of a wheelchair footrest so a vertical tube of a crutch should work, too.